This article sums up the lecture given at the Stanton Williams Architects´office in London on the 22th February 2012. Ferrán Adriá and his restaurant, El Bulli, have been considered during the last few years the best chef and the best restaurant in the world. Adriá has been the inventor of a new way of cooking, the molecular gastronomy. Throughout a very complex creation process, taking into account textures, flavors, contrasts and sensations, he has showed to the world a new way of enjoying the gastronomy. -The day to day gastronomy: The aim is to feed us in the most simplistic and tasteful way as possible in the shortest period of time of food preparation. -The gastronomy for special events: When we try to use a better quality products in a more sophisticated way of cooking than in the day to day gastronomy. -The avant-garde cuisine: The aim is to achieve a whole new experience of feelings with the gastronomy thanks to an intense creation process. Although almost everybody is capable to cook, the general public understands these different types of gastronomy. And more important, they accept this game and want to play it. I mean, even if the products they are eating in the avant-garde cuisine are mostly the same they can find in their fridges, they are ready to pay more money because they know that they are consuming something unique which is the result of a very complex creation process and of applying new revolutionary cooking tools. They are paying the creation process, not the raw material. And the general public understands this. People as Ferran Adriá have become very success on the media, and they are now part of the popular culture. What about the architects? 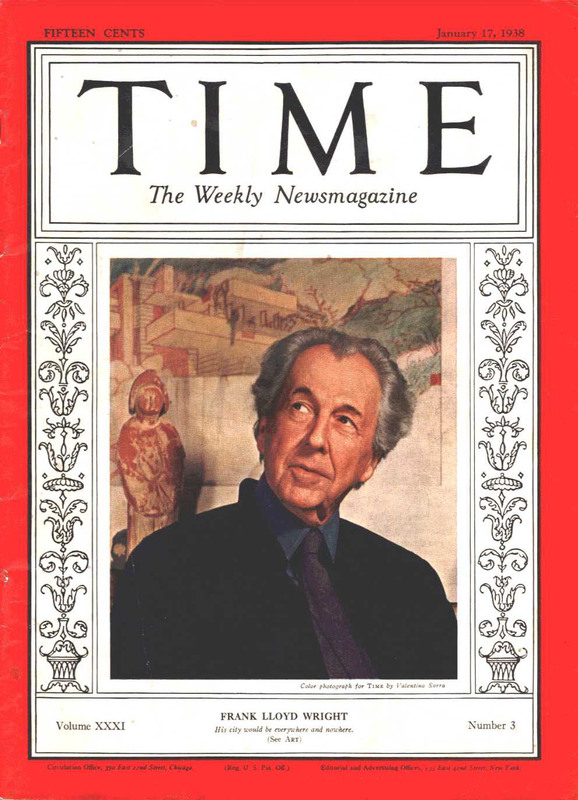 Since the first issue of Time magazine in 1923, fifteen architects have appeared on its cover. The most of them during the 50s and the 60s. As the world most highly distributed weekly news publication, the cover of Time has typically been allocated to individuals of political and economic power and, more recently, celebrities and entertainment figures. The appearance of architects within this framework of power and fame signifies an evolution of the interest and relevance of architecture to the general public. The 50s was an era in which architects broke the boundary of trade and professional journals, resulting in a strong representation in mainstream publications such as Time. These Time covers from a previous age reflect a different attitude towards architects, which we have lost today. So, how are the architects seen by the general public today? Movie directors as George Lucas, Steven Spielberg or Peter Jackson are also very popular and well considered within the popular culture today. People know that a film director is not specialized in all the technical aspects of the movie, but the general public knows that the director is the person with the enough knowledge to control the whole team in order to achieve the same objective, the film. There are many similarities again in the way a film as Star Wars is created, and they way an architect create a project. However it seems that for the general public is not so clear. Indeed, I have been asked many times the same question. What do you do as an architect? Or what is the difference between and architect and an engineer? Steve Jobs used to say that the aim of all the Apple products was to be in the exact limit between the art and the technology. In my opinion the good architecture should be the same. At the moment that you are getting closer to one of the two limits, the architecture becomes less and less interesting. The relation Steve Jobs and Steve Wozniak had at the very beginnig of Apple could be very similar to the relation an architect and an engineer could have in any project. Wozniak was the brain, Jobs was the soul. Wozniak was the responsible of making Jobs’ ideas work. Jobs´ job was to get to know people´s needs and give them an answer. The final product was the result of the two of them working together. Art and Technology. In the advertising world, as well as in the architecture world, the communication with the client is essential to be able to sell your ideas. The architects in general have an important communication problem. We are very closed in our own world. We only want to appear in specialized magazines for exclusive architect consume, we have prizes that are only followed by other architects… In general architects communicate properly only with other architects. We are out of the popular culture. The internet today gives us much more tools than in the 50s in order to get in touch with the general public, but it seems that even like that the architects of the 50s had more success in catching the attention of the media than we are today. So, what is the reason for this situation? -Are the architects today a part of the popular culture? -What does it mean to be an architect for the general public? -Do the architects know how to speak the same language as the general public? -Do the architects know how to sell their work to the general public? Muchas gracias por tu visita. Me alegro que te haya gustado. Saludos.